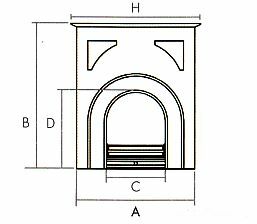 The Abingon cast iron fireplace by Carron fireplaces originally dates from around 1890. This late Victorian period cast iron fireplace is unusual due to its lack of decoration. The fireplace is very understated in style, less typical than many over ornate fireplaces of the same period.